Alexander Remels was born on the 13th of February 1982 in Herk-De-Stad, Belgium. After finishing high school, he started studying Biomedical Sciences at Hasselt University (Belgium) and Maastricht University (Netherlands) in September 2000 and received his Masters’ degree in 2004. 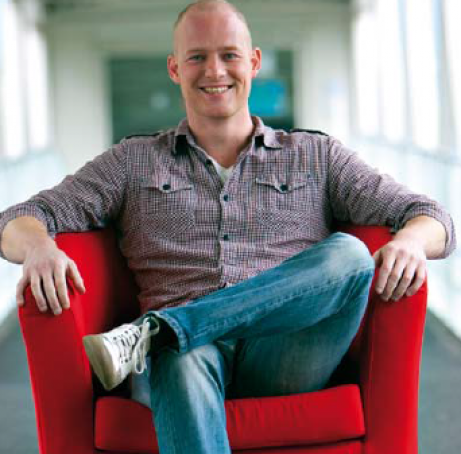 After graduating, he started a PhD at the Department of Respiratory Medicine at Maastricht University. He received his PhD in 2009 for his thesis ‘’A molecular basis for the loss of muscle oxidative phenotype: implications for COPD’’ in which he investigated abnormalities in skeletal muscle mitochondrial energy metabolism and the molecular regulation thereof in Chronic Obstructive Pulmonary Disease (COPD). After finishing his PhD, he obtained a long-term travel fellowship from the Dutch Lung Foundation to work at the lab of Dr. D. Guttridge at Ohio State University, USA for 1 year. After this, Alexander returned to the Department of Respiratory Medicine at Maastricht University and obtained several grants including a Kootstra Talent Fellowship from Maastricht University, a NWO VENI grant and a Junior Investigator Grant from the Dutch Lung Foundation to continue his research on the molecular regulation of mitochondrial energy metabolism. His research has focused on the impact of inflammatory processes on oxidative- and glycolytic energy metabolism in cardiac and skeletal musculature. He is currently working as an Assistant Professor at the Department of Pharmacology and Toxicology at Maastricht University where he is involved in teaching within the Faculty of Health, Medicine and Life Sciences and performing research on mitochondrial energy metabolism in multiple cell types and tissues and investigating potential pharmacological/nutritional modulation thereof in health and disease.